This article explains you 'how to connect to the internet with your bluetooth and mobile' When you are using XFCE Window Manager.If you don't use XFCE window manager than it's better follow this article [Link] because it's easy and it's bluetooth files will take small space. 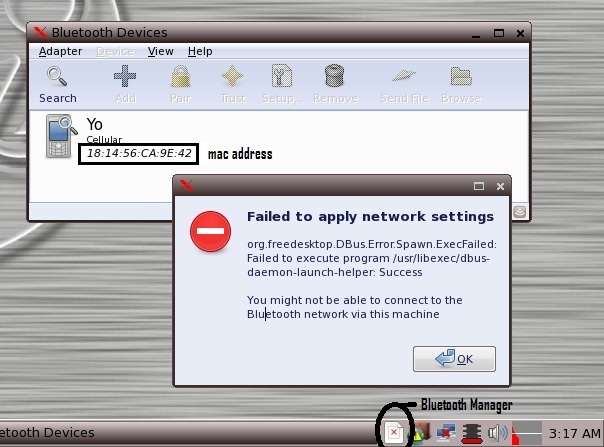 If you get error 'failed to apply network settings' than again press OK and you will find bluetooth manager icon as per picture shown below .. Despite the fact that there are some fluid asthma meds that ought not be utilized as a part of a ultrasonic nebulizer, its a helpful alternative for people groups. Thanks for sharing us this amazing blog. Hi Welcome to Mike's Place previously known As ZrayumTech. Here you can find my articles and softwares. Hi there If you are here to register one of my software you can click here to paypal me. Software registration keys are priced at 7$.I'll send you keys on your email address in generally less than 24 hours as I get paypal payment email.Thanks ! Hey There, Have a Nice Day !